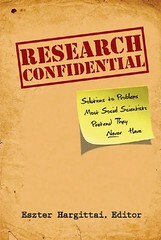 My edited methods book Research Confidential is out! I had asked for feedback about the title and cover illustration on Crooked Timber and here at Eszter’s Blog and accordingly have acknowledged the readers of both blogs in the Preface (see snapshot below) including an explicit shout-out to CT reader Vivian for inspiring the subtitle of the book: Solutions to Problems Most Social Scientists Pretend They Never Have. Today’s Inside Higher Ed has a Q&A with me about some questions related to the book such as why I opted for asking relatively junior scholars for contributions rather than going with more experienced senior researchers. Recently, the Chronicle also featured a Q&A with me about the chapter I co-authored with Chris Karr describing diary-data collection using text-messages. Many thanks to the contributors of the volume for agreeing to respond to my somewhat unorthodox request to write about the behind-the-scenes dirty details of their research projects. If you’d like to read these, various online stores (e.g., Amazon, B&N, Michigan Press) are selling the volume. This entry was posted on Friday, October 30th, 2009 at 7:49 am	and is filed under General update. You can follow any responses to this entry through the RSS 2.0 feed. Both comments and pings are currently closed.